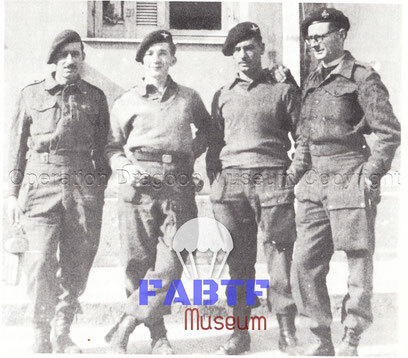 O'FLAHERTY Patrick, 4th Parachute Battalion, August 15 1944 - Site de operationdragoon ! 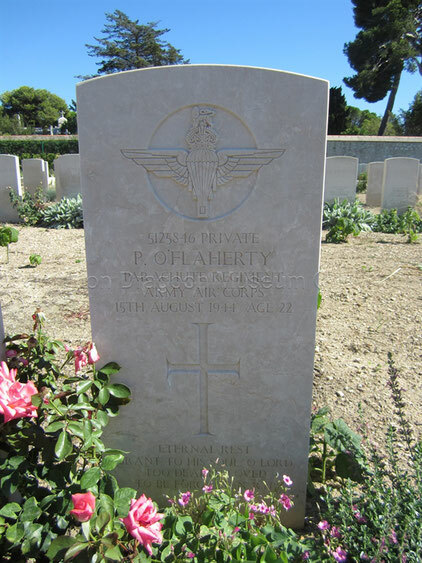 Paddy O’Flaherty was one of the mess waiters in 4th battalion. He lived in Birmingham, but was as irish as his name, and could always be relied on for one of this two songs. « Paddy McGinty’s goat » and « The garden where the Praties grow ». During a spell in hospital he had taken up embroidered, and this skill came to be much in demand when new uniforms arrived, but the stores had no wings to sew on them. I had bought a rather beautiful white Stole in Bari, but i felt it needed more colour at some points in the embroidery, and had obtained some silk at a church shop in Rome for the purpose. I asked Paddy to add the colour, wich he did happily, giving me back the Stole three days before we flew to France. 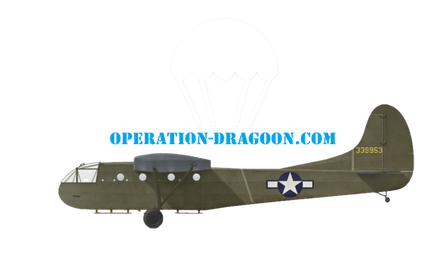 In France he descended safely, and was accidently shot dead as soon has he landed. Some twenty years later i gave the Stole to a convent of wonderfull Nuns, neighbours to my church in Manchester. Irish Song "Paddy McGinty's Goat"
Irish Song "The garden where the praties grow"